If you're looking for Rock drums, either for production or scoring work, you should definitely make checking out this library a priority. Huge range of articulations and microphone options in both libraries. Performance Kits let you hear the 'whole kit' before individual patches provide detail. Electronic percussion sounds seem tokenistic. The second collection resulting from Spitfire Audio and Han Zimmer's joint efforts to create a near-exhaustive cinematic percussion library is subtitled Los Angeles and brings a third collaborator onboard. Alongside Spitfire Audio's sample creation know-how and Zimmer's legendary reputation as a composer, the HZ02 collection features the drum playing of Jason Bonham, son of Led Zeppelin's John Bonham. Jason's extreme hard-hitting appeals not only to Rock enthusiasts but to composers too, with drum kit performances forming the backbone of plenty of films and TV series. Jason Bonham's distinctive sound, which has led to his work on Zimmer scores such as Man Of Steel, comes not only from the strength with which he hits the skins but also from his chosen kit itself, which is a unique, customised DW Vistalite kit. "Everywhere you look, this library provides detail over every aspect of drum kit recording"
This has been set up and recorded in three separate locations to form the HZ02 library: the Newman Stage at 20th Century Fox, the Sony Stage (still affectionately referred to as the MGM Stage by many in Hollywood) and The Cathedral, a huge concrete space within Hans Zimmer's own studio facility, Remote Control. HZ02 was recorded by regular Zimmer engineer Alan Meyerson and was principally mixed by Steve Lipsom and Geoff Foster. Once you've downloaded, installed and authorised the library, you firstly select one of these stages from a dedicated folder before deciding whether to load a Performance Kit or a single instrument type. If you load one of the kits, you'll be greeted with a multi-sampled MIDI mapped kit (with kicks on C1, snares on D1 etc) ready to play and sequence as you would with any other drum library. Alternatively, if you load an individual instrument type, you'll then be greeted with multiple playing styles for each instrument, including stick and beater types, different microphone mixes, and so on. So, having sequenced a pattern, you can then assign a pretty staggering amount of control and detail to the performance of each kit piece from these dedicated patches. As with all Spitfire's libraries, these samples have been captured using multiple microphone configurations too, between which you can balance using the dedicated level sliders towards the top of the GUI. These include Close, Gated, Room and Outrigger perspectives, meaning you can often blend between the sharpness of close mic'ing and the impressively large spaces in which the drums have been recorded. "Anyone needing a heavy, multi-sampled rock kit for their productions should give its acquisition some serious thought. And, as concerns playing variations, the snare alone contains variations for regular and bamboo sticks, felt mallets and playing types, including snares on/off, Edge Hits, Flams, Rolls, Side Hits and many more. These vary from one recording space to another too, so it's well worth looking in the folder for each stage to pick and choose sounds for your productions. The full list of instruments recorded in this ultra-detailed way is Crash, Crash Ride (with Combos featuring both together too), Hi Hat, Ride, Kick, Snare, Snare Alternatives, High Tom, Mid Tom and Low Tom. However, even this list doesn't really do the library justice as the Cathedral recordings include Bonham's DW Snare alongside alternative Maple and Brass Snares, multiple Kicks, and so on. Indeed, everywhere you look, this library provides detail over every aspect of drum kit recording. Such is the microscopic level of detail available here, we should dispel the notion that this is a drum library for composers alone; anyone needing a heavy, multi-sampled rock kit for their productions should give its acquisition some serious thought. However, the more alternative playing techniques offered will certainly have composers who seek fresh sounds for their scoring palettes salivating; the soft mallet cymbal swells are a personal favourite, alongside the bamboo hits across a range of instruments. 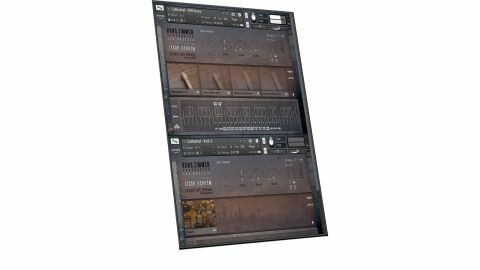 Lastly, there's a kit of Hans Zimmer's own electronic percussion sounds. We're a little surprised these have been included - whilst they're perfectly usable and useful sounds, in the context of larger electronic drum libraries, a single kit of electronic sounds seems a touch tokenistic. That's not in any way to detract from the core programs in this library, however, which are great to play from the Performance Kits but, more importantly, supremely detailed when it comes to assigning individual articulations to each kit piece.